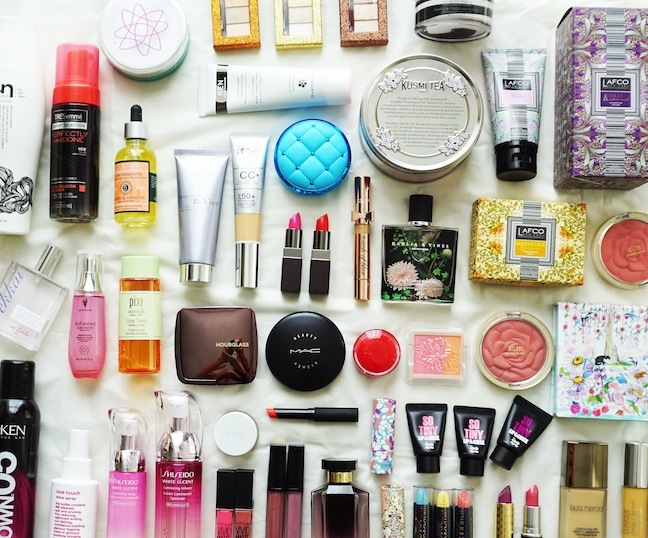 Like I said in the first part of this post, I go through a lot of beauty products in order to winnow down the best and brightest featured in each issue of Composure Magazine. (Hey, it’s a tough job, but someone’s gotta do it.) It’s a good thing I’m a product junkie, because the more I test, the more I learn, and the more discerning I become about ingredients, textures, feel, finish and — yes — packaging. And in my journey, I’m learning that expensive does not necessarily mean better, that a pretty package can mean a crappy product, and that technology in beauty (driven by those mad, genius scientists over in Korea) is such that a small, indie beauty company may have the next best thing. In fact, just like fashion, it’s no longer about a vanity overladen with the entire line of one beauty brand — you have to mix and match, according to your beauty needs. 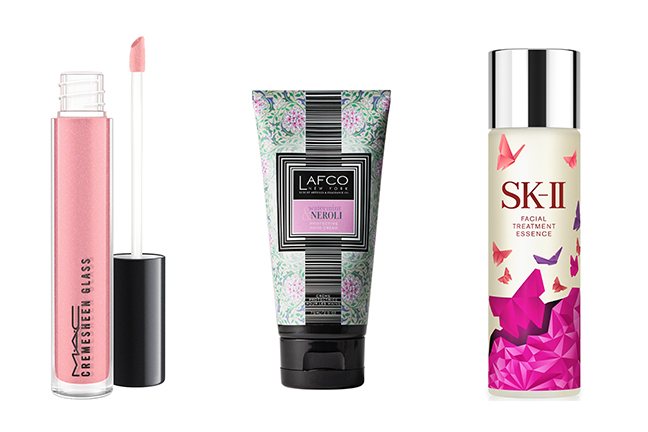 So herewith, my newest beauty discoveries from the latest issue of Composure. Natural hair was all over the spring runways, with hair stylists backstage emphasizing a “rough dry” (no blowout, no round brush) to bring out each model’s natural texture. Thank goodness because I can’t give myself a blowout to save my life. I’ll be finishing my lazy girl rough dry with this spray, which imparts a light, airy finish. Redken Wind Blown 05 Dry Finishing Spray, $19, ulta.com. We’ve seen hydrogel, biocellulose, even real kelp as sheet masks. This one by Estée Lauder Lauder elevates the sheet mask to a whole other level. This two-part mask features a unique foil-backed sheet mask that you place on top of the more traditional mask, allowing 25 times faster penetration of the brand’s cult favorite Advanced Night Repair formula, says the company. (You only need to wear the mask for 10 minutes, as opposed to the usual 20 to 40.) Even better: Just save the foil and reuse for your next masking session. 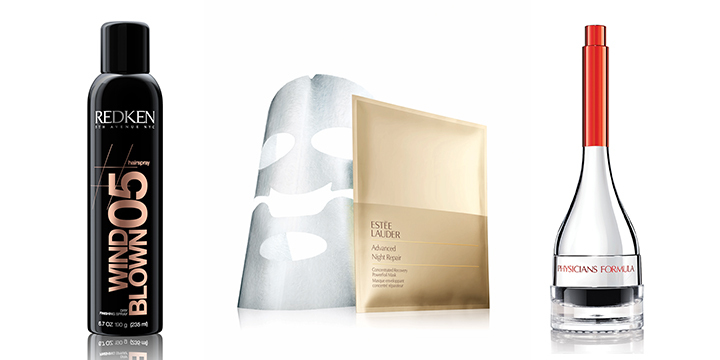 Estée Lauder Advanced Night Repair Concentrated Recovery PowerFoil Mask, $79 for 4, esteelauder.com. The ingenious cushion format of this liquid eyeliner is so cool, you may forget that the formula also contains a lash-boosting serum. The attached brush does get sticky after a few uses, though, so I use my own liner brush to “stamp” on the wing. It prevents that part of my upper lash liner from smudging and fading after a few hours (thanks, sagging eyelid). Physicians Formula Eye Booster 2-in-1 Lash Boosting Cushion Eyeliner + Serum, $11.95, physiciansformula.com. As a gloss girl, I love me some M.A.C Cremesheen Glass, and this one is no exception, from M.A.C’s latest collection, Flamingo Park. You may not be able to see it here, but there are tiny blue specks in this pale pink gloss, which brighten and whiten teeth. M.A.C Flamingo Park Cremesheen Glass in Look Who’s Here, $20, maccosmetics.com. The entire LAFCO line, from candles to body products, boasts seriously luxe, layered scents, all derived from natural essential oils. They’ll make you feel like you’re lying in a bed of flowers. LAFCO Watermint & Neroli Protective Hand Cream, $18, lafco.com. The classic Facial Treatment Essence from SK-II — one merchandiser from Sephora once told me she swore this was the only thing that could fade her brown spots — in the prettiest new bottle. This is something I buy anyway, though I will say, some of the latest hydrating toners and essences I’ve tested are giving it a run for its money. SK-II Limited Edition Facial Treatment Essence, $229, nordstrom.com.